Internatial brand PLC & HMI for program operation. Packing materials: Stretch film, paper, Knit belt... are applicable. Works for on line and off line packing. Speed is controled by converter. Fork lifting position for form truck loading and unloading. Packaging tension is adjusted by special breaker. Guardrails, soft start and soft stop are for safety. The best packaging position is adjusted automatically. Indicator alarms automatically when trouble occurs. Trouble can be shown on the screen. Powered roller table is used for the transport of the master bundles in and out of Master Orbital Wrapping Machine. The table is outfitted with free and powered rubber coated rollers. The speed of the roller table is driven by motor with the gear box, which is adjustable. 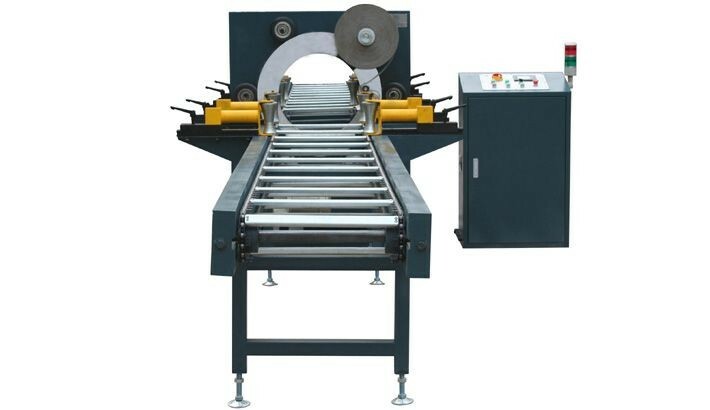 Orbital wrapping machine designed to wrap master bundle using stretch film. The operation of the machine is completely automatic. The machine is fitted with a pneumatic movement to ensure that the master bundle is positioned in the center of the wrapping ring during the wrapping operation. This movement ensures that the material applied to the bundle is applied in a uniform way ensuring maximum tightness.